Sunday's (11/4) rains didn't wash away the Second Annual Scott Campbell Feed the Community event at Lake Ella. In the midst of occasional showers, the bands played and Second Harvest of the Big Bend received lots of non-perishable food donations. As Sunday's rains abated, the crowds grew at Lake Ella to hear the music and help the food drive. 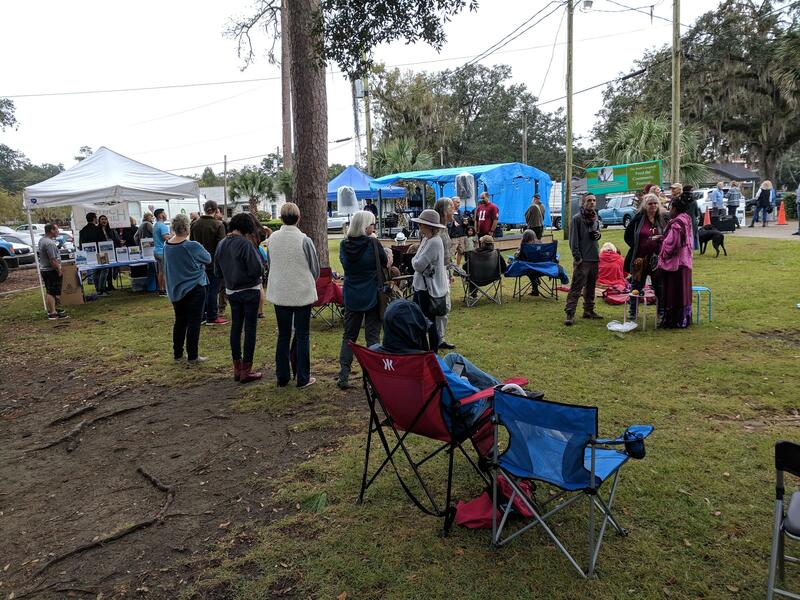 This was one of many food and fundraisers in the area since Hurricane Michael, said Second Harvest's Mary Dekle. "In 10 days after the storm, we put out 1.4 million pounds of food," she noted. "We received almost 2.5 million pounds into our warehouse. Our staff was working around the clock and we still are." And while her organization deeply appreciates all the food, Dekle said the big need now is for money. "We need the resources to purchase more, to get more trucks and the staff out there, because for every dollar we raise, it provides about four meals." Sunday's non-stop music came mostly from people who had played over the years with popular Tallahassee singer-songwriter Scott Campbell. He had founded the event and kept it going until a bit before his death almost two years ago. The Second Annual Scott Campbell Feed the Community Festival happens this coming Sunday, Nov. 4 at Tallahassee's Lake Ella. The recent hurricane has increased the urgency of the occasion. Tallahassee rock music fans are doubly mournful today. Two much-loved musicians with Capital City connections are dead.